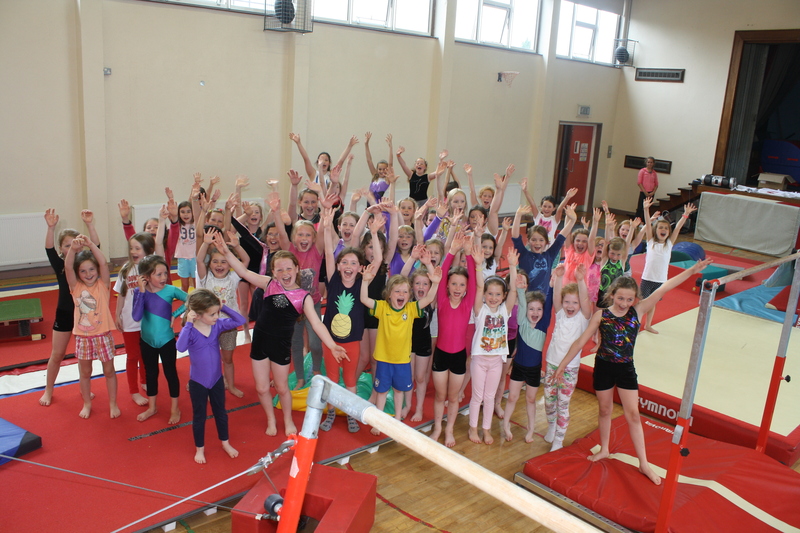 Olympian Gymnastics Camps focuses on developing gymnastics skills over the course of the camp’s week. The camps run during the week from 9:30am – 2:30pm. They begin with a warm-up and conditioning to prepare the gymnasts for the day ahead and they also have two break-times between the various gymnastics rotations. Our trained coaches work closely with their gymnasts to help them work intensively on skills from our different apparatus: Floor, Beam, Bars and Vault. We also introduce Trampette, Air Track, and Acrobatics to teach them different elements of gymnastics training. We always ask our gymnasts to choose a skill or two as a goal for the week, and if they achieve that skill they get to ring the bell and show it to everyone. The gymnasts also partake in the Team League where they can compete in challenges and games, the winning team receive a small prize at the end. We have camps both of the weeks over Easter in some of our Templeogue, Knocklyon, Alexandra and Ballinteer venues. Some highlights include: Easter Egg Hunt and Team Challenges. Over the 8 weeks of Summer we held camps in four venues: Templeogue, Knocklyon and Alexandra. Registration is NOW OPEN. Some highlights include: Display Performances and Bouncy Castle. We will have camps in three venues this Halloween: Templeogue, Knocklyon, and Milltown. Registration is Now Open. Some highlights include: Halloween-themed games and Treasure Hunt.